As Spotify’s Facebook love blooms, several other minor (and not so minor) changes were sneaked into Spotify at the same time. We’ll come back to the new Facebook + Spotify features shortly, but for now here’s a look at all those other tweaks and improvements. Playlist Sharing to People List – You can now share an entire playlist in one go to friends in your people list (previously you could only share single tracks), and there’s now an auto-complete drop-down list of friends. What impact this has on sites like ShareMyPlaylists.com remains to be seen. Share Icons – The share icon (which, incidentally, is identical to Deezer’s share icon) is now visible on all tracks and playlists. Inbox Icons – The Inbox now has a set of new icons to indicate whether the shared item is a track, an album (disc icon), or a playlist (note icon). The “New in Inbox” counter is now also red to add a splash of color to Spotify’s grayness. 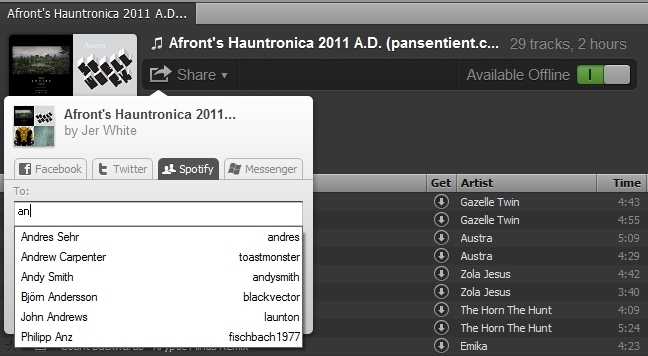 Add To Folder – Right-click on a track, album or playlist then select Add To. There’s now an option to add to a folder. Persistent Column Width – Now when you resize a column it’s applied to all playlists and is remembered even after you restart Spotify. Streamlined “Appears On” – Previously, when you viewed an artist page and scrolled down to the “Appears On” section you’d see all the other artists on each album too. This made it difficult to just see the artist you were interested in, so now Spotify only shows the artist’s track (you can click a “see all tracks” link to view the other artists). Thx to @Spotimy for pointing this one out. Radio – The full radio is now available in the US, and the genres have been updated to include Black Metal, Death Metal, Emo, Classical and a few others. The metal emphasis is clearly in response to the spate of metal labels pulling their content from Spotify. The year sliders have been removed (thanks to akrde for pointing this out) as have genres Disco, Funk, Hard Rock, House, New Wave, and Techno. Facebook Account REQUIRED – It seems that new users now must have a Facebook account before they can use Spotify. This major change has only just been revealed and I can see it becoming quite contentious for the few music fans who want to maintain their anonymity. Fortunately if you already have a Spotify account you’re not forced to sign up to Facebook to use it. Finally, according to Spotify Classical Playlists “more than 99.9% [of tracks] are available in high bitrate (320 kbps) for our Premium users.” About time too!